Being a writer is an art form. You have to have a creative mind and an artist’s soul to be able to write freely. Edinboro University Vice President of Student Affairs Dr. Kahan Sablo is resigning after nearly 18 years at Edinboro. 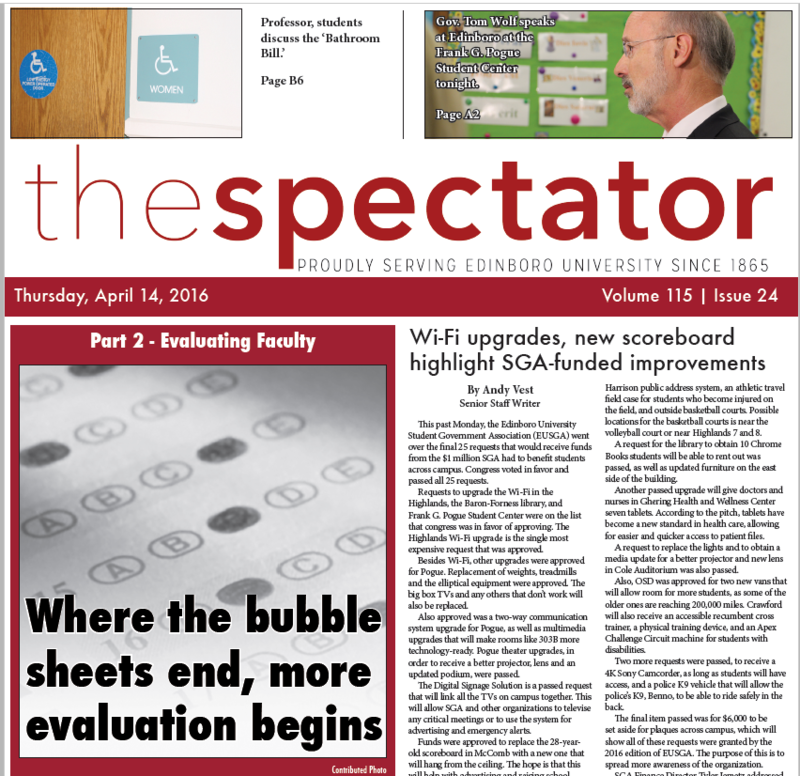 This past Monday, the Edinboro University Student Government Association (EUSGA) went over the final 25 requests that would receive funds from the $1 million SGA had to benefit students across campus. Students were able to speak one-on-one with representatives at each of the tables and comfortably voice concerns and suggestions for the parts of the university. Bubble sheets can only tell you so much. When professors want more feedback than their student evaluations provide them with, they might visit ratemyprofessor.com. Another spring season means yet another annual show at the Erie Art Museum. Last week, electronic band M83 released its seventh album “Junk.” This album is the first without former front man Morgan Kibby. The Lumineers’ sophomore album “Cleopatra” was released last week with Dualtone Records. Following the release of several singles over the course of the year thus far, the Deftones' latest album "Gore" has finally dropped, bringing with it critical acclaim from many publications. The Scots came to town, halting Wheeling Jesuit’s three game winning streak and giving them a 7-5 record for the season. After being awarded PSAC Wrestler of the year, true freshman Patricio Lugo traveled alongside Fuller to New York City for the National meet. In less than a month from now Edinboro Universtiy will be commencing with the Spring 2016 graduation. Now, we're in the process of transitioning into the next phase of our life. Welcome to the feelings of outgrowing your present life. The 2016 Presidential race has certainly served a distinct platter of popularity and diversity, yet the public is always hearing that name. Yeah you already know where this is going. Trump. Road trip anyone? Studying abroad or backpacking Europe, whatever your dream is, go for it. From someone who travels a lot, here are some travel tips any travel guru should know. The Edinboro University Psychology Club is an organization that complements the academic learning in the classroom with educational, social and service events designed to increase knowledge about the field of psychology and to increase friendships and support among those students interested in psychology. 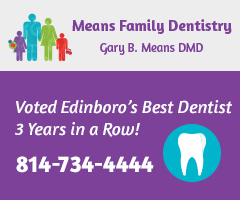 Edinboro University implemented a new Parenting program, as well as opened a new parenting resource room in Ghering Health and Wellness Center at the end of March. Natalie and Britton rundown festival tips following Natalie's trip to Coachella 2019. Also featured: Lizzo, Kacey Musgraves and more. Edinboro University announces the narrowed field for the vacant university president position. Reviews of newly released music from Bruce Hornsby and Theia written by members of the Spectator staff. In a week full of weather-induced game changes, the only doubleheader played as scheduled resulted in a pair of losses for Edinboro when first-place Seton Hill rolled into town Saturday. Students from the 14 PASSHE schools, gathered at the state capitol in Harrisburg from Tuesday, April 9 to Wednesday, April 10. Overheard debates: DC versus Marvel, who wins? 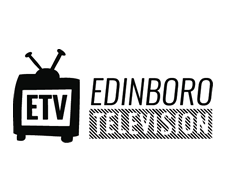 2019 © Edinboro Campus Media. All Rights Reserved.